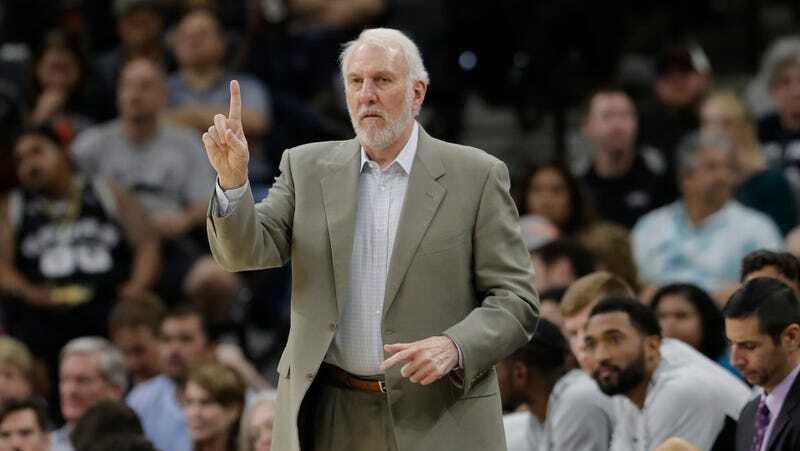 Gregg Popovich Called Up Dave Zirin To Call Donald Trump A "Soulless Coward"
Gregg Popovich has never been hesitant to criticize Donald Trump when reporters ask him for his thoughts. However, in the wake of the president’s baffling claim that Barack Obama “and other presidents” never called grieving military families, Popovich, who served in the Air Force, went out of his way to get his takes on the record. I’ve been amazed and disappointed by so much of what this President had said, and his approach to running this country, which seems to be one of just a never ending divisiveness. But his comments today about those who have lost loved ones in times of war and his lies that previous presidents Obama and Bush never contacted their families, is so beyond the pale, I almost don’t have the words. This man in the Oval Office is a soulless coward who thinks that he can only become large by belittling others. This has of course been a common practice of his, but to do it in this manner–and to lie about how previous Presidents responded to the deaths of soldiers–is as low as it gets. We have a pathological liar in the White House: unfit intellectually, emotionally, and psychologically to hold this office and the whole world knows it, especially those around him every day. The people who work with this President should be ashamed because they know it better than anyone just how unfit he is, and yet they choose to do nothing about it. This is their shame most of all. Gregg Popovich Goes Off On Trump: "Our Country Is An Embarrassment In The World"
Gregg Popovich Blasts Donald Trump&apos;s Election In Lengthy Monologue: "We Are Rome"